Blue Mountain, online at bluemountain.com, is a great place to send loved ones creative Ecards. Whether sending an Ecard for a birthday, Christmas, get well soon, etc, Blue Mountain has a variety of different reasons to get in touch with loved ones in a very imaginative way. 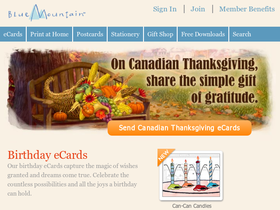 Blue Mountain not only has regular Ecards but also has talking Ecards, postcards, letters, and more. Join Blue Mountain's membership and receive unlimited access to everything they have to offer, a reminder service so that you never have to forget a special occasion, desktop customization, and much more. Check out RetailSteal.com for all the latest Blue Mountain discounts, Blue Mountain promo codes, and Blue Mountain coupon codes. Use this promo code at bluemountain.com and get a free pack of 25 greeting cards when you purchase a pack of 25 greeting cards at regular price. Use this promo code at bluemountain.com and enjoy $25 savings on a custom photo creation. Shop at bluemountain.com and get a free calendar when you purchase 2 calendars at regular price. Use this promo code at checkout to save. Use this promo code at bluemountain.com and enjoy $4.99 off shipping. Sign up for a membership at bluemountain.com and save 69% off the original price. Visit bluemountain.com and save 58% off a one year membership. Click here to save.